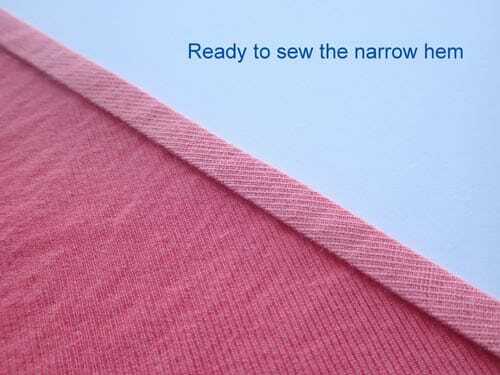 In today's example, we are looking at the narrow hem. This would be more suitable for light weight fabrics with no stretch and can often be found on gathered skirts, circle skirts and anything where a stiff or wide hem would interfere with the hang of the skirt. This depends again on the weight and fluidity of your fabric, as well as your own sewing skills. When a pattern calls for a narrow hemline, I would suggest that a 1/4 inch was considered narrow. You can of course get much narrower hems than that, let's call that a tiny hem, and reserve that for a future article. In order to achieve a really neat and even result, you'll need to sew slowly and carefully and follow some kind of guide. 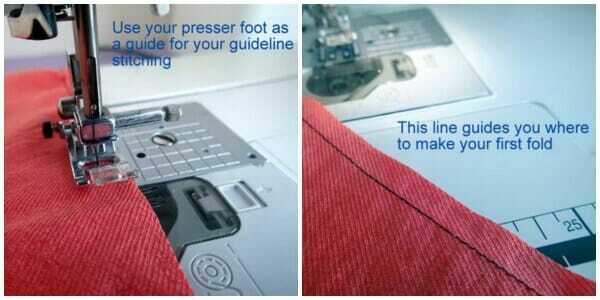 The most obvious guide to use is the edge of your sewing machine presser foot. 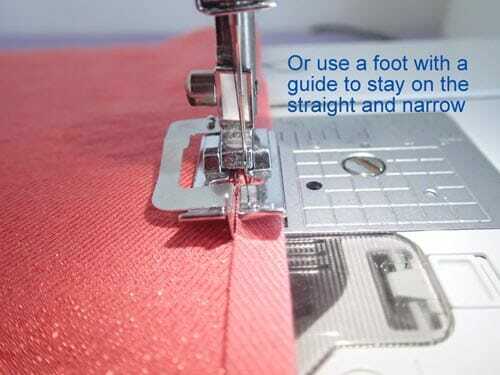 The regular presser foot will usually allow you to place the edge of the foot along the raw edge of the fabric as you sew and get a reasonably narrow seam. If you can adjust the position of your needle left and right, then you can move it more to the right to get a narrower line of stitching. Step 1. 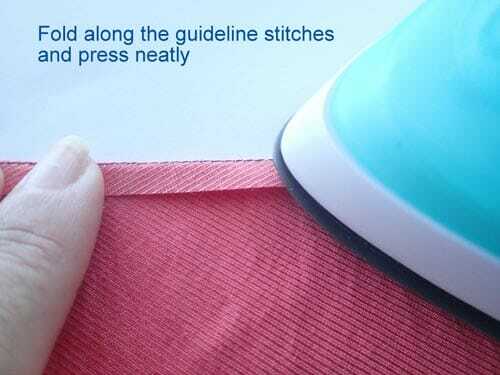 Line up your presser foot with the edge of the fabric, set your needle position and stitch a line of ‘guide stitches' along the length of the hemline. Step 2. 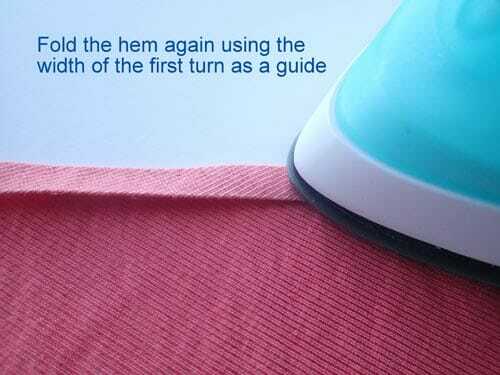 Use this guideline of stitches to turn over a narrow hemline and press it firmly and neatly. Step 3. Fold the hem over on itself once more to hide the raw edges. Use the width of fabric you just turned as a guide for turning the second time. 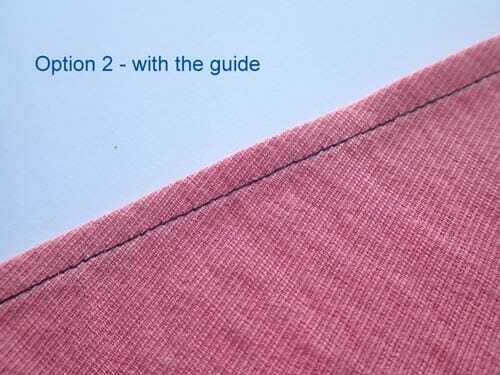 The guideline stitches will be just about hidden inside the turned over fabric. Press again neatly. Step 4. (Option 1) Stitch again close to the top fold of the hem, keeping your eyes right where the needle will fall to make sure you are sewing evenly. Sew slowly and neatly. Step 4. (Option 2) If you have some kind of edge guiding foot, you can use this to help. My blind hemming foot looks a little bit like an ice-skate underneath and I can run the blade along the fold of fabric, set my needle position and sew. This helps me sew neatly, but it also helps me sew faster than Option 1. That might be good if you are sewing a large circle skirt with yards and yards of narrow hem to sew. You can also set the foot the other way, so the blade is on the outside of the hem with the needle position all the way to the left. See which works best for you. 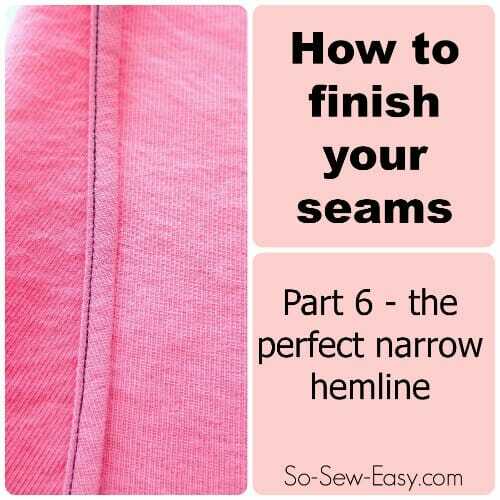 Press your seam neatly and admire your narrow hemline. 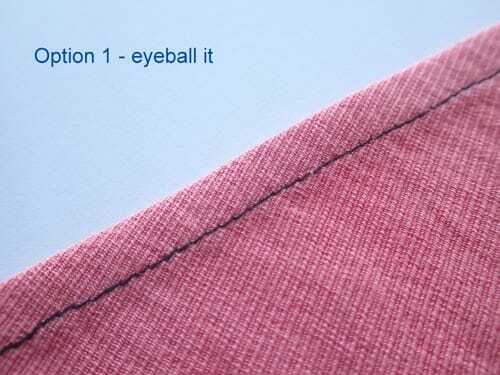 Here is my Option 1 – sewing by eye. Not bad, but slow. Here is my Option 2 – with the guide foot. Not much difference but much faster. 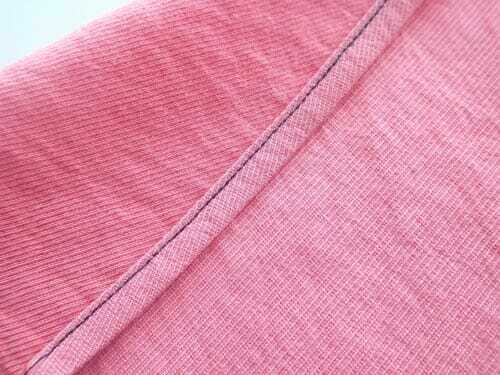 And a look at the inside of the narrow hem. Pretty neat. Looking for others in this series? What an amazing article and what a great blog! What a great idea to use the blind hem foot, I’ll definitely try that. Your tutorials are so clear! 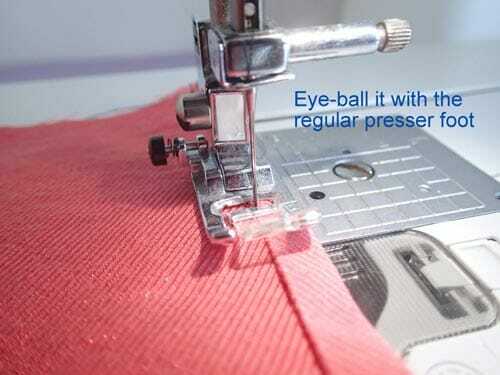 I have trouble sewing in a straight line so any little tools and tricks that can help make it easier are a good idea. Thanks for your kind comment. Thank you for sharing, great idea love anything that makes sewing easier. neat! totally great idea!! Love when it’s a easy fix to make something hard so much easier.